Every year Smashwords does a special event called “Read an Ebook Week” with tons of discounts for fantastic books from every genre. This year’s week has started and I’m proud to announce that you can now receive a FREE copy of my book “Enemy of my Enemy”. 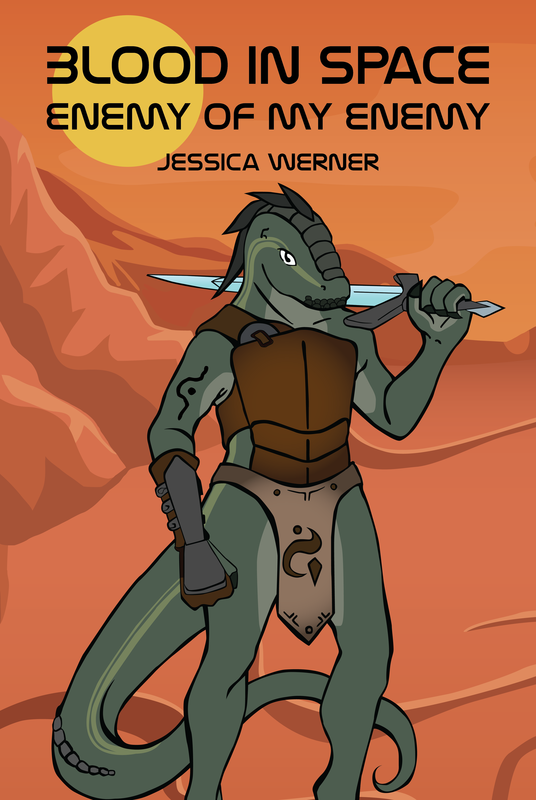 Larenssa always dreamed of a life as a strong warrior. All of her young life she trained to be ready and bring honour and glory to her tribe. Passing her initiation rites posed a challenge, but it pales in comparison to what she will endure during her personal hunt. From now on until March 11th you can get a copy of “Enemy of my Enemy” for absolutely FREE from Smashwords.com and follow the adventure of Larenssa yourself. Simply use the code FC74V during checkout and the discount will be applied! Feel free to share the special with your friends and on your social media and share the love. Also if you like “Enemy of my Enemy” I would LOVE if you’d take the time to write a review on Smashwords or Goodreads. It’s finally here! I’m so excited! 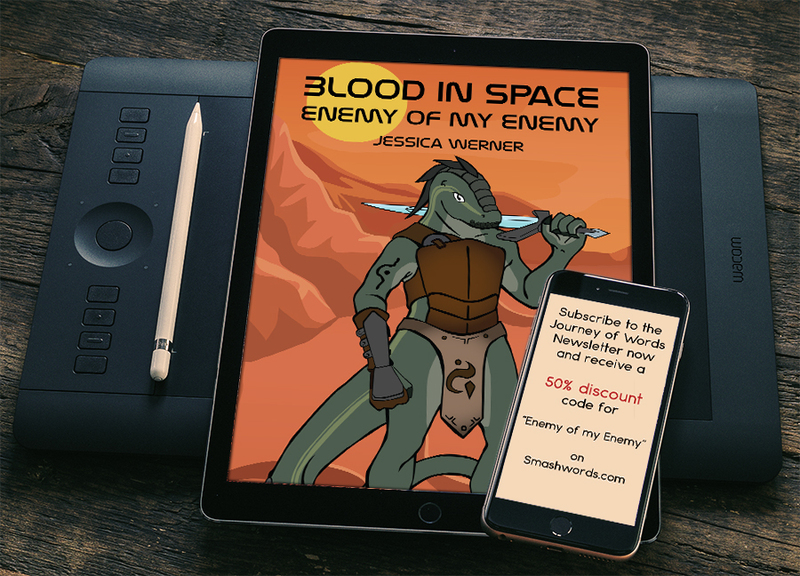 As I have mentioned a few times before I wrote a novelette, based in a roleplaying universe my friend Jonathan Snyder has developed: Blood in Space. That novelette is finally done and published by Epic Worlds Press! I have a ton of fun writing the story around the young Atelak Larenssa and hope that you’ll enjoy reading about it just as much. This novelette is available as Ebook on Smashwords and as print book on Lulu. I promised you a subscriber special! Everyone on my subscriber list and those who will join receives a 50% discount code for the ebook version on Smashwords! That is to thank you for your support and interest in my writing. I’m looking forward to have you and if you like it I’d appreciate a review on Smashwords, Lulu and/or goodreads. Thank you and have fun reading!! Get Sra’kalor for 50% off for Black Friday Weekend! It’s Black Friday and that means everyone wants to get some great deals! And I want to join in. For this weekend you can get Sra’kalor (Ashwood Falls Part 1) for 50% off on Smashwords. head on over to Sra’kalor on Smashwords. If you do not have an account yet, you should make one, they have a great variety of fantastic books! click the buy button. That puts the book in the cart. Now you can check out and after completing the purchase you can download the book right away in different e-reader formats such as: mobi, epub, pdf and more. Hope you’ll enjoy your little treat! Have a fantastic weekend! Giveaway winners have been chosen! The big giveaway has ended at midnight and of course you guys want to know if you won or not. I can tell everyone who entered: Congratulations, you won! Auryn, Jenny, Amanda, Ray, Jennifer, Debbie, Sonja, Sandra, Nessie and Lily. I am super excited to announce a big giveaway raffle for 25 (!) ebook copies of Sra’kalor, the first part in the Ashwood Falls Trilogy! 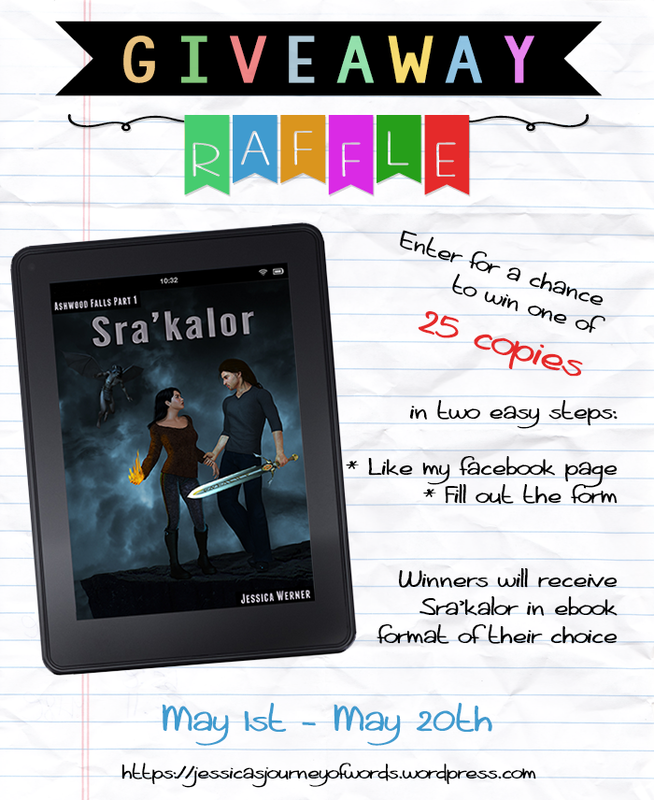 Everyone entering the Raffle from now on until May 20th has a chance to win one of 25 copies in the ebook format of their choice. All you have to do is like my facebook page Journey of words and fill out the form. The winners will be chosen through a random name picker, among those who did both. Yes, it is that easy 🙂 Here are the links to everything you need! Facebook page: Journes of words to like! Giveaway Form to fill out! Over the years I have not only written stories and songs nobody might ever get to see, but also poetry. Not the kind that rhymes and follows structure, but the kind that comes from the heart. A compilation of my poetry has now hit the Amazon Bookshelves. This collection of poetry is my past, my present and my future. There is not one theme I write about, but anything, that finds its way into my mind. 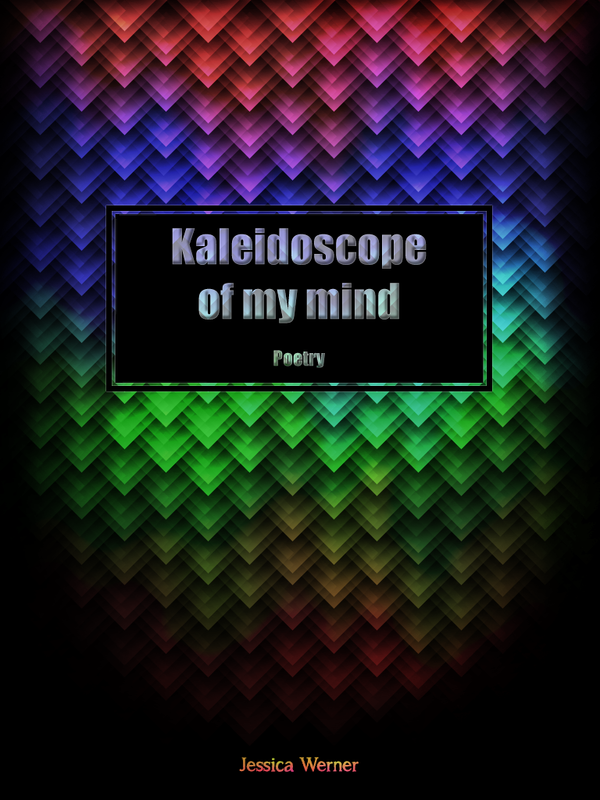 I hope you will enjoy, the facets, the kaleidoscope of my mind. I have entered Kindle Direct Publishing (KDP) Select. That means you can find the book in amazon’s Kindle Owners’ Lending Library and through Kindle Unlimited. That also means that it is available world wide! I’m excited to say, that Sra’kalor, the first part of the Ashwood Falls Trilogy, is now available on amazon as well. And not only in Germany, where I live, but worldwide! 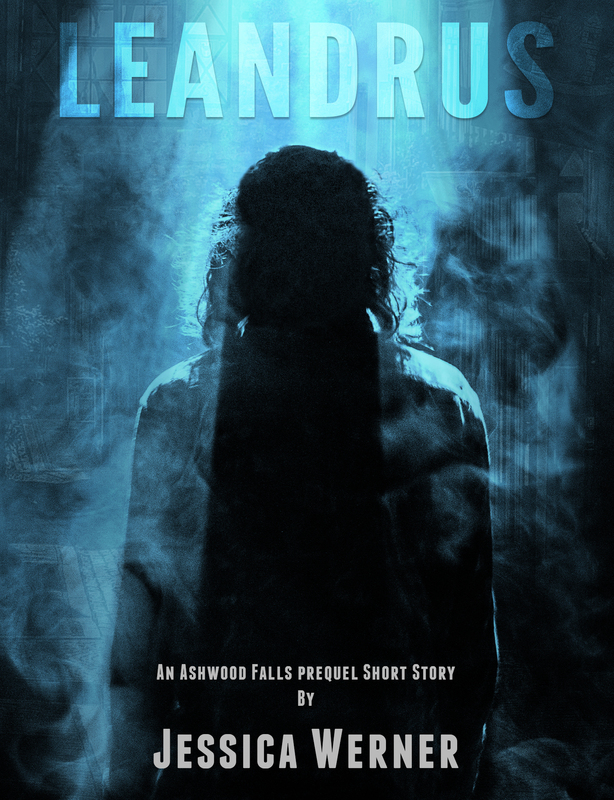 I hope that this will make it possible to bring the story of Alana and Leandrus to more of you, who did not have a smashwords account to get it for yourself. Sra’kalor – it is finally here! The wait is over! Sra’kalor, the first part of the Ashwood Falls Trilogy, is finally here! Leandrus, a powerful demon, had been summoned before. But this time it was different. His powers, and the summoner, were nowhere to be found. The demon makes his way into the foreign town on his own. The problem? The soul of his human host had not been banished and keeps making his life difficult. As if that was not enough, he can sense that his ‘One’ is near. As he finds Alana – sweet, innocent and inexperienced – he cannot believe that an old prophecy has chosen her to destroy him. To avoid his own destruction, he has to eliminate her first. You can find Sra’kalor at smashwords in epub, mobi (Kindle), pdf, rtf, lrf, pdb and online reader formats. A reading sample is available as well! 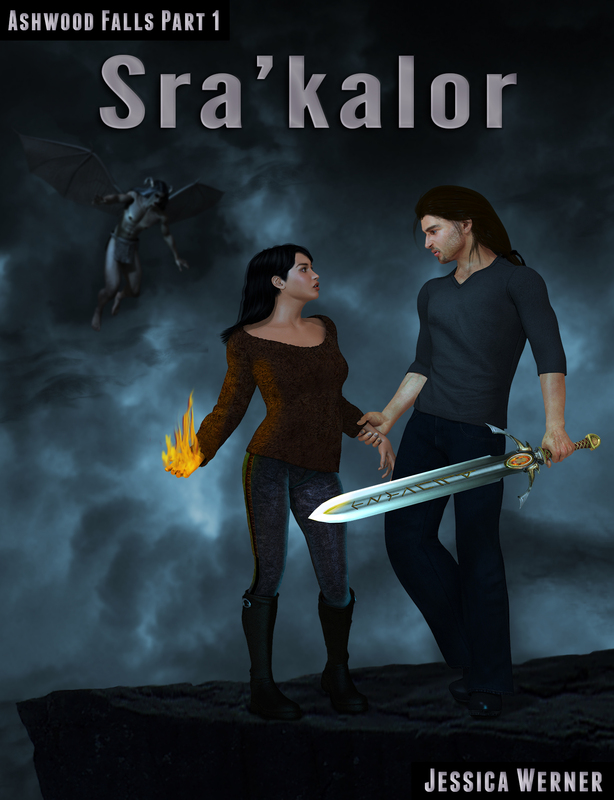 Come on over to smashwords and grab your very own copy of Sra’kalor!